CHARLES JOHN BOWEN COOKE, C.B.E., was born near Peterborough, on 11th January 1859, and was educated at the Preparatory School, Cheltenham, and King's College School, London, and later on the Continent. He entered the Crewe Locomotive Works as a premium apprentice in 1875, and afterwards became a pupil of the late Mr. F. W. Webb. On the completion of his pupilage he was appointed assistant to the Superintendent of the Running Department of the Southern Division of the L. and N. W. Railway, and was afterwards assistant to Mr. G. Whale, when he took over the entire control of the Running Department. When Mr. Whale was made Chief Mechanical Engineer, Mr. Cooke became Superintendent of the Running Department, Southern Division, and on Mr. Whale's resignation in 1909, he was appointed Chief Mechanical Engineer. 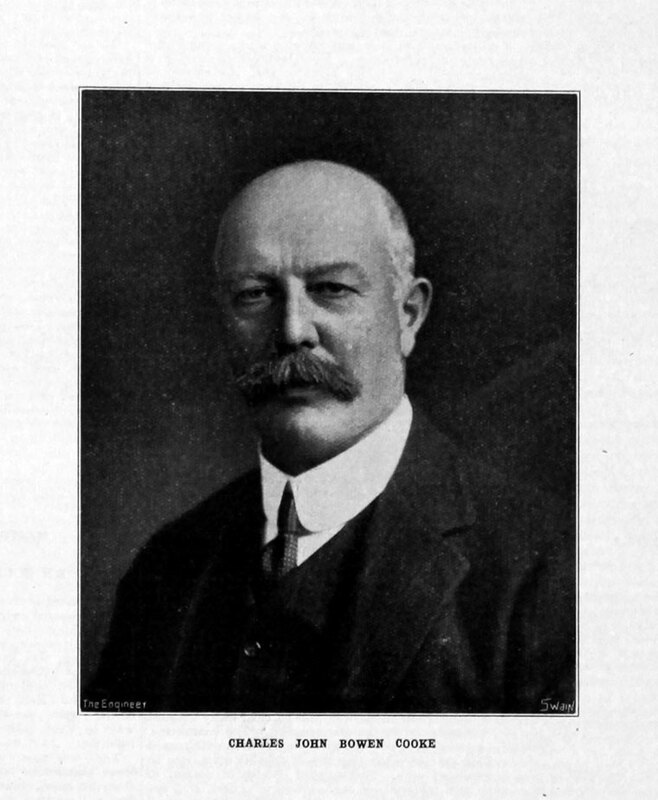 Mr. Cooke was responsible for the introduction of mechanical coaling and ash-handling plants on British Railways; also of 4-cylinder simple locomotives on the L. and N. W. Railway, and many new classes of engines, of which probably the most famous is the "Sir Gilbert Claughton" class, brought out in 1913. During the War he was a member of the War Manufactures Sub-Committee of the Railway Executive Committee, in which capacity he performed valuable services to the country, and a member of the Machinery and Metals Committee of the Inventions Panel appointed by the Ministry of Munitions. At Crewe a type of tractor was developed out of a Ford car, armoured trains were built, a great deal of forged and other work turned out in addition to small material, overhead cranes, rails, etc. He served on several Committees connected with the Railway Executive Committee, the Ministry of Munitions, and Ministry of Transport. He paid several visits to France during the War in connexion with the working of the military railways, and visited America in 1917 to purchase material for British Railways. Besides numerous articles on railway engineering subjects, he wrote several books on locomotives which were accepted as standard works, and played an important part in the training of students. He was Mayor of Crewe during 1918-19, and served on the Cheshire County Council. He was also a Justice of the Peace, and Major in the Engineer and Railway Staff Corps, R.E. (T.F.). Early in 1918 the King conferred upon Mr. Cooke the Commandership of the British Empire in recognition of his services to the country. His death took place at Falmouth on 18th October 1920, in his sixty-second year. Read his obituary in The Engineer 1920/10/22. He became a Member of this Institution in 1912; he was also a Member of the Institution of Civil Engineers. This page was last edited on 23 May 2016, at 10:21.